The U.S. military, in a perverse attempt at transparency, reported on April 17 that the ongoing hunger strike at Guantanamo Bay had expanded to 52 from 47 prisoners. Other reports have estimated up to 130 prisoners out of 166 on hunger strike. The strike begin in February over the mistreatment of prisoners' Qurans, and has since morphed into a powerful protest against the shameful prison camp and its policy of indefinite detention. The recent expansion of the hunger strike comes after guards in riot gear stormed Camp 6 on April 13 and forced detainees out of their communal living area and into single cells. Some prisoners resisted with improvised weapons and were shot with rubber bullets. The military claims it took this action to reassert control over prisoners who had covered security cameras and were refusing to follow orders, and also to make sure no prisoners were being “forced” to go on hunger strike. Despite their alleged concern for inmates being able to exercise their free will, at least 11 prisoners are now being force-fed by prison authorities. They are completely restrained, sometimes in a specially made chair, and then have a tube forcibly inserted up their nose and down into their stomachs. The very existence of a camp where communal living with limited access to things like books, television and religious materials—something akin to “medium security”—raises interesting questions. The popular image of Guantanamo Bay is of a place where hardened terrorists are held, the worst sort of killers. In fact, a majority of the prisoners, 87, even the American government admits should be released. Instead, they are held without any charges. This indefinite detention of innocent men can be ended at any time by the president and Congress. However, they continue to take steps that suggest they plan to extend the policy. A Boston Globe editorial notes that recent changes to medical personnel for prisoners suggest that the government is preparing to hold some prisoners for the rest of their lives, without any charges. After deciding to use the Guantanamo Bay military base, itself a legacy of the former colonial relationship with Cuba, Bush administration officials quickly decided to turn it into a torture and indefinite detention facility. 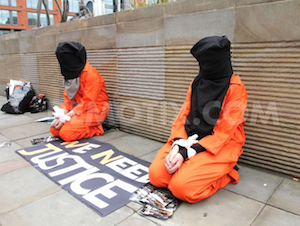 Guantanamo Bay is essentially the 21st-century version of the Tower of London. Whether there are charges or not, guilty or not, perceived enemies of the American government can be thrown into Guantanamo’s prison camps and the keys quickly disposed of. This comes on top of the fact that in the few sham trials formally known as “Military Commissions,” impartiality is completely flouted. The government has used secret censors to cut off access to the proceedings and spied on defense meetings with their clients. Even close allies like the United Kingdom and Yemen have lodged protests with the U.S. government about their unwillingness to return home their nationals who have been cleared for release. It is clear that the U.S. government is seeking to shut down the hunger strike to avoid having more light shone on the torture and de facto life sentences. The cause of the hunger strikers should be taken up by all progressive- and revolutionary-minded people. The Guantanamo Bay prison is just another example of how the “War on Terror” is a brutal smokescreen for a policy of unending imperialist war aimed at maintaining and expanding the U.S. empire.